The Facebook we see today has very little resemblance to the social media platform the world fell in love with and thought it would be the ideal place to connect with friends and family and share memories. It is now a fully fledged online media publishing platform with an extreme focus on monetizing each and every bit of user interactions found on the site. Facebook has pioneered social commerce and is always looking for new ways to drive revenue both directly and indirectly. In it's latest test, the social media giant is now offering monetizing groups by giving admins the option to implement monthly membership fees. Subscriptions are currently being piloted with a select number of groups and may be rolled out more widely depending on user feedback. Facebook says that subscriptions are being introduced as a way to support group admins who give their time and energy to maintaining communities. According to the company, admins have been requesting this type of feature. Here’s how subscription Groups work. First, a user must be in a larger group where the admin has access to the subscription options and posts an invitation for members to check it out. They’ll see preview cards outlining what exclusive content they’ll get access to and how much it costs. If they want to join, and they’re already an approved member of a larger free group, they’re charged the monthly fee right away. They’ll be billed on that date each month, and if they cancel, they’ll still have access until the end of their billing cycle. That prevents anyone from joining a group and scraping all the content without paying the full price. The whole system is a bit similar to subscription patronage platform Patreon, but with a Group and its admin at the centre instead of some star creator. 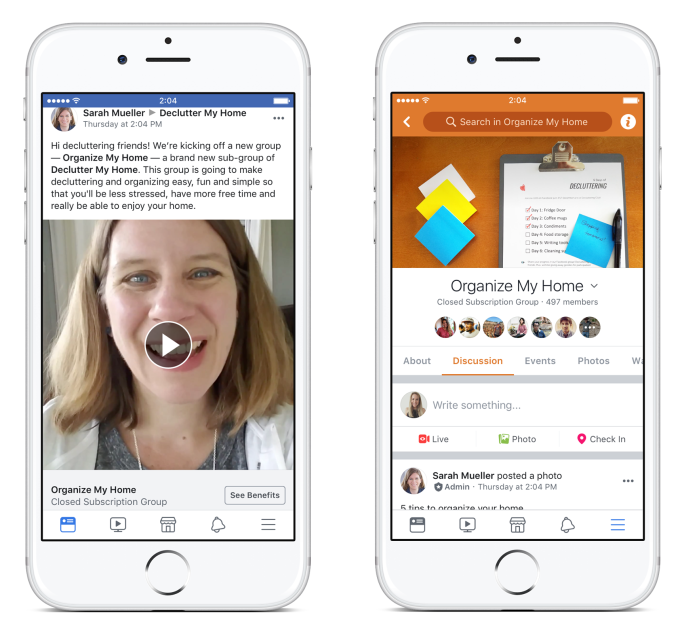 Members will be able to sign-up and manage their subscriptions through the Facebook app for iOS and Android. But I expect to see this feature expand and evolve as Facebook begins to study the data and learn more about the experience from both members and group admins. Subscriptions the next billion dollar idea? We've seen SAAS businesses begin to drive the content subscription model aggressively with the likes of Netflix proving that the content subscription model is a financial dream. Subscriptions offer businesses high customer lifecycle value. This means high-margins and annually recurring revenue streams, allows for rapid growth and works because consumers are willing to pay monthly for access to good content. So it seems like a no-brainer that Facebook would try its hand at the content subscription business is a good thing. The issue really is will it work and can they successfully entice content creators to use Groups as a place where consumers will be willing to pay for their content. In terms of numbers, Facebook Groups had over 1 billion users two years ago, so it is a widely used feature of Facebook. Many of these Facebook Groups tend to have content which is of high interest, engagement and regular contributions from Group’s participants. So offering Group admins the option to create exclusive content of greater value and lock it behind a paywall could prove to be popular enough. Not all of the Group members will pay up for that content, but some will. And with over 1 billion Group users, Facebook doesn’t need a lot of people to pay up in order for this idea to turn into something huge. Facebook looks dead set on taking on the likes of Youtube in being the preferred platform for online content creators to monetize their efforts and share in a piece of it. By making it easier for individuals to monetize they own efforts it provides them with a monetary incentive to firstly constantly create fresh content and secondly maintain a relationship with their audience and keep users on the site longer. The longer users are on the site the more online real estate can be used to serve them ads and ultimately have them selling more impressions to advertisers.